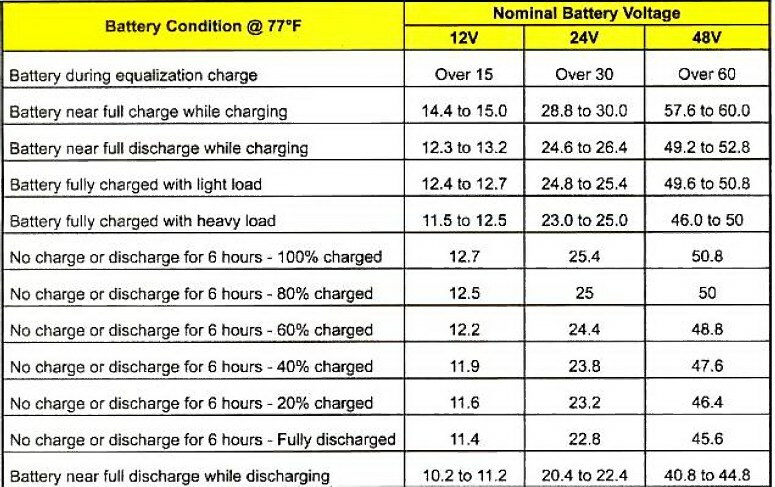 Some battery manufacturers recommend very high charging voltages to "top off" their batteries. Before we get into my biased opinions let me tell you a story. with an Edison base (standard screw in base). These were offered in either 12 or 24 volt models. could not be set at a high charging voltage. The 24 volt models started coming back for warranty repair. when the batteries were having an equalization charge. LIT repaired the lights and returned them with a warning to shut them off during the day. what is it doing to the devices you have connected to your batteries. Also, your batteries generate heat when being charged. High battery temperatures can shorten battery life. more water - something to consider. I always recommend at least one inch between each battery to allow for cooling. relation to the size of the battery. conditions in flooded cell lead-acid batteries. While charging, a lower temperature will increase battery voltage. Full charge voltage on a 12 volt battery is 0.9 volts higher at 32 deg. 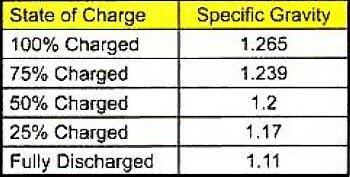 F.
While discharging, a higher temperature will increase battery voltage. There is little temperature effect while a battery is standing. the electrolyte near the plates after it has been at rest. Unfortunately, you can only measure the electrolyte at the top of the battery. takes place at the border between the lead plates and the electrolyte. During charging the electrolyte changes from water to sulphuric acid. The acid becomes stronger and the specific gravity rises as the battery charges. be taken at the top of the battery. Always try to take readings after a period of no charge or no discharge.